I've always been a big fan of juice, but I've tried to cut back over the past few years just due to the amount of sugar. 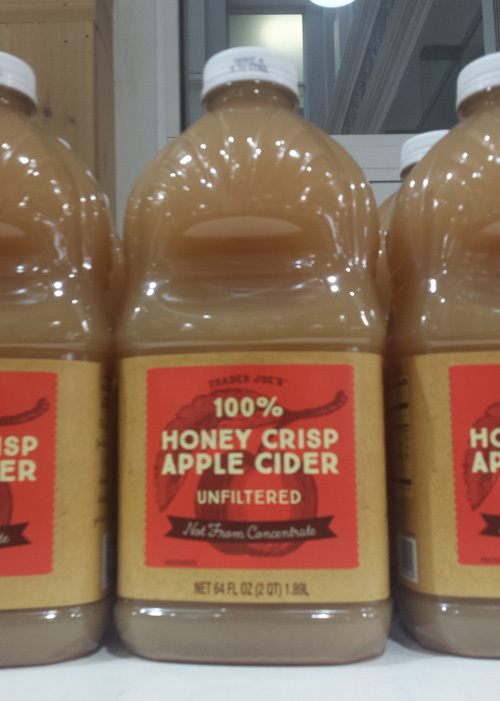 When I saw this unfiltered cider though, I had to get some. The first year I lived in NYC, in 2009, I was sick all winter and one of my favorite things to drink while I felt like crap was unfiltered apple juice. For some reason, a lot of people I've mentioned this to turn up their noses at the "unfiltered" bit, but I would actually argue that unfiltered juice (or in this case, cider) is way better than filtered. Why? Because I've found that with apple juice, there's a tendency to have juice that's a bit on the syrup-y side. You might not notice this if you've never had unfiltered juice before, but I definitely noticed after I started drinking unfiltered. The unfiltered juice, by comparison, has a much smoother, almost silky kind of texture. I've also read that unfiltered can be healthier, as the extra filtering for regular juice removes some of the nutrients. But this isn't a health blog, so I'm more concerned with taste here, and unfiltered just has a better taste and texture. As for the taste of this particular Apple Cider, I thought it was pretty great, as you might be able to tell from my 9/10 rating. It had a good, smooth flavor that wasn't too sweet, and actually tasted like real apples. My only complaint about this is that I generally prefer my cider to have some spices added for flavor, and there wasn't much in here. If you're looking for a warm tasting cider, this probably isn't it, but it's pretty good when you don't go into expecting a spiced cider kind of flavor. I'll definitely pick some up again!